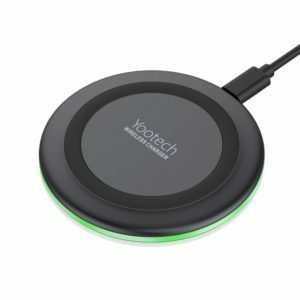 Yootech Wireless Charger Qi-Certified 7.5W Wireless Charging Compatible with iPhone Xs MAX/XR/XS/X/8/8 Plus,10W Compatible Galaxy Note 9/S9/S9 Plus/Note 8/S8,5W All Qi-Enabled Phones(No AC Adapter) is now available at Amazon.com for just $14.99 (REG $39.95) (As of 28 January 2019, 23:09 PST – Details) with $24.96 (62%) Savings. 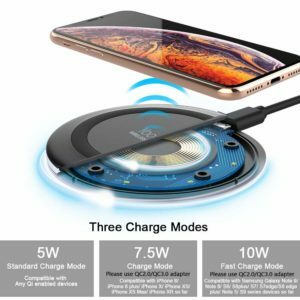 7.5W,10W and 5W WIRELESS CHARGING MODELS 7.5W model *Using QC2.0/QC3.0 adapter (9V,1.67A) is ONLY compatible with iPhone 8/ iPhone 8 plus/iPhone X so far; 10 W model *Using QC2.0/QC3.0 adapter(9V,1.67A) is ONLY for Samsung Galaxy S9/S9plus/S8/ S8plus/S7/S7 edge/S6 edge plus/Note 5 series devices so far;5W model *Using 5V,2A adapter is for Any Qi-enabled devices like iPhone X/8/8 plus and other Qi-enabled phones. Please use the most appropriate adapters for best results. TEMPERATURE CONTROL TECHNOLOGY Exclusive Multifunctional Intelligent Protect Technology provides temperature control, surge protection, short-circuit prevention, and more. 0.47in thickness design plus intelligent temperature control system ensure cooler but more efficient charging. To get better experience, we would like you to take off the phone case and use our recommended adapters (NOT INCLUDED) and cables. IMPORTNAT NOTICE IF INDICATOR KEEPS BLINKING Please check phone’s back(or case) is not attached with any iron,metal,coins,IC Cards,bank cards,magnetic absorbers and other metal objects in the charging detective area. PLEASE NOTE THAT CHARGING WITH PHONE CASE (ESPECIALLY over 4mm ONE) MAY INFLUENCE THE CHARGING SPEED OR EVEN RESULT IN CHARGING INTERMITTENTLY OR DISCONTINUED. 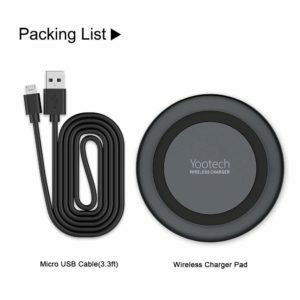 Basically, Yootech wireless charger works with Rubber/Plastic/TPU Cases etc. ;MUST be within 4mm thin. SLEEP-FRIENDLY Yootech smart indicator design is for your enjoying life more. 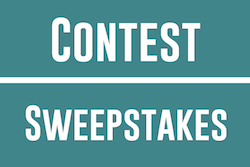 Please site your phone at the center of the pad correctly. 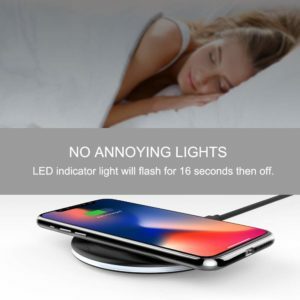 GREEN LED indicator will flash for 3 seconds if power source is connected, while LED light turns on for 16 seconds if recognizes your phone well. Entering charging model, light turns off and keeps the whole charging process SLEEP-FRIENDLY. 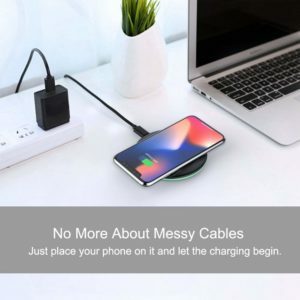 PACKAGE & WARRANTY You will get 1 x Qi Wireless Charger Pad, 1 x 3.3ft Micro USB Cable, 1 x User Manner. 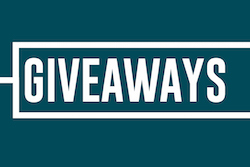 NO-Hassle 18 months money back/replacement warranty with 12-hour response service is friendly offered. 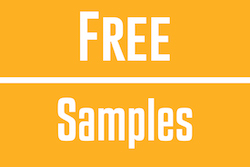 At Yootech, ZERO Risk purchase guarantee is for every customer’s smiles. 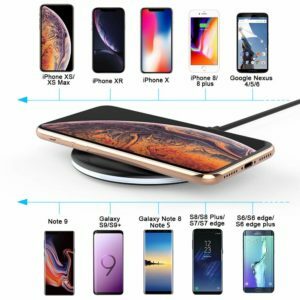 Qi certified by the Wireless Power Consortium, safe for charging. 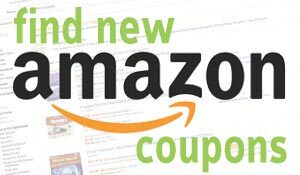 Compatible with all Qi-certified devices. Light in weight, suitable for both home and office, and easy to take it with you when go out or traveling. The led light will turn off and keep the whole charging process sleep-friendly once recognize your phone is charging. 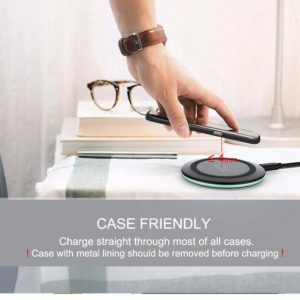 Can charge your phone with case on, suitable with most of the phone case, and we recommend ≤4 mm thickness for better charging result.